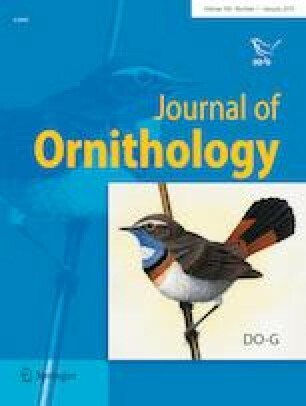 Extra-pair paternity in socially monogamous Streaked Shearwaters: forced copulation or female solicitation? Seabirds are long-lived birds that invest in offspring at very high levels, for which male parental care is indispensable. These characteristics are thought to explain seabirds’ generally low level of extra-pair paternity (EPP). Although the Streaked Shearwater (Calonectris leucomelas) is a socially monogamous seabird, it is known to copulate outside its social pair bond, which implies the frequent occurrence of EPP. In the closely related Cory’s Shearwater Calonectris borealis, cuckoldry is related to body size of the social male. To determine whether body-size-related EPP occurs among Streaked Shearwaters, we established 39 new microsatellite markers for parentage analysis and compared body size between cuckolded and non-cuckolded males. With the new markers, we found that extra-pair males sired 17 (15.0%) of 113 offspring during the 2014–2016 study period, which included three 1.5-month chick-rearing periods. This percentage is among the highest recorded for seabirds. We also found the bill and wing length of cuckolded males to be significantly shorter than those of non-cuckolded males, and that females can reject attempted copulations. These observations imply that EPP in this species is size related and involves female acceptance. The online version of this article ( https://doi.org/10.1007/s10336-018-1587-3) contains supplementary material, which is available to authorized users. Fremdvaterschaft bei sozial monogamen Weißgesicht-Sturmtauchern: erzwungene Kopulation oder weibliche Aufforderung? Seevögel gehören zu den langlebigen Vogelarten, welche in hohem Maße in ihre Nachkommen investieren, was eine väterliche Fürsorge unerlässlich macht. Diese Eigenschaften sollen den generell geringen Grad an Fremdvaterschaften (engl. extra-pair paternity, EPP) bei diesen Vögeln erklären. Obwohl der Weißgesicht-Sturmtaucher (Calonectris leucomelas) zu den sozial monogamen Seevögeln gehört, sind bei dieser Art Kopulationen außerhalb des sozialen Paarbundes bekannt, was ein häufiges Auftreten von EPP nahelegt. Beim nahverwandten Gelbschnabel-Sturmtaucher Calonectris borealis hängt das Fremdgehen mit der Körpergröße des sozialen Männchens zusammen. Um festzustellen, ob eine körpergrößenbezogene EPP beim Weißgesicht-Sturmtaucher vorkommt, haben wir 39 neue Mikrosatellitenmarker für die Vaterschaftsanalyse etabliert und die Körpergröße zwischen „betrogenen“und „nicht betrogenen“Männchen verglichen. Mit den neuen Markern konnten wir zeigen, dass Männchen außerhalb des Paarbundes 17 (15,0%) von 113 Nachkommen während des Untersuchungszeitraumes 2014-2016 zeugten. Der Untersuchungszeitraum umfasste drei Jungaufzuchten von jeweils 1,5 Monaten. Dieser prozentuale Anteil gehört zu den größten, die bislang bei Seevögeln ermittelt wurden. Weiterhin haben wir festgestellt, dass Schnabel- und Flügellänge der „betrogenen“Männchen signifikant kürzer als bei den „nicht betrogenen“Männchen waren. Zudem zeigte sich, dass Weibchen Kopulationsversuche abwehren können. Unsere Beobachtungen lassen bei dieser Art eine größenbezogene EPP vermuten, bei der die Akzeptanz des Weibchens erforderlich ist. We thank Yoshinari Yonehara, Yusuke Goto, Tatsuya Shiozaki, and Takanori Sugahara for assisting with fieldwork on Funakoshi-Ohshima Island. We are grateful to Aran Garrod, Bart Kempenaers, and an anonymous referee for insightful comments that improved the manuscript. This study was supported by grants from research fellowships of the Japan Society for the Promotion of Science for Young Scientists to Miho Sakao, Tohoku Ecosystem-Associated Marine Sciences, the Bio-logging Science Program of the University of Tokyo, National Geographic (Asia 45-16), Japan Science Technology Agency Core Research for Evolutional Science and Technology (JPMJCR1685), the Cooperative Program of the Atmosphere and Ocean Research Institute, the University of Tokyo, and the Japan Society for the Promotion of Science and OP under the Japan-UK Research Cooperative Program. The authors declare no conflict of interest. All procedures performed in this study involving animals were approved by the Animal Experimental Committee of the University of Tokyo and conducted in accordance with the Guidelines for the Care of Experimental Animals. This work was conducted with permission from the Ministry of the Environment and Agency for Cultural Affairs, Japan.